This lacy stitch is a open crochet stitch made with loops of chains. 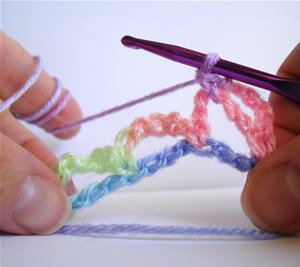 It is very easy to crochet. 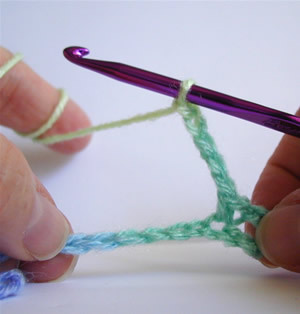 You just need to know the single crochet stitch. 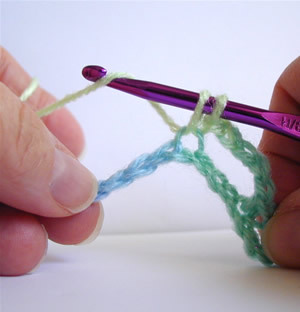 Here is a refresher on that stitch, see the single crochet tutorial. Use this stitch to make an interesting scarf, a pretty table runner, or even a poncho. The photo at the right is a poncho that I made with this stitch using ribbon yarn. You can also use this stitch for a market bag using cotton yarn! Start with a foundation row of a multiple of 4 chains, plus 2 extra. 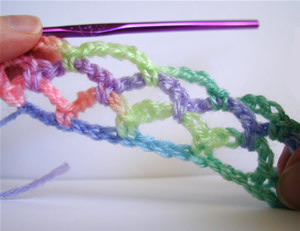 Row 1: Make a single crochet in the 6th chain from the hook. Skip next 3 chains and make 1 sc in the next chain. Repeat from * to the end of row 1, turn. 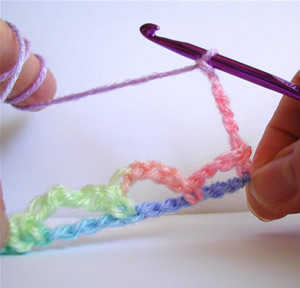 Make a single crochet in the next 5-ch loop. Repeat from ** and continue in this pattern across entire row. Repeat Row 2 until desired length is made. This entry was posted on Thursday, April 7th, 2011 at 12:12 PM by Robin Beers	and is filed under Tutorials and Help. You can follow any responses to this entry through the RSS 2.0 feed. You can leave a response, or trackback from your own site. What a lovely stitches! I love it! I hope I can try this. Thank you for this, and all other tutorials, this site has taught me so much. I would just like to know if it’s possible to get the name of the yarn used in this tutorial, it’s so pretty. You’re very welcome, Emma. Glad you are enjoying the site! I do not remember what the yarn was from my tutorial, can you believe it? I know it is worsted yarn in a variegated pastel colors, but I have had it so long in my stash as a remnant from a previous project, that I cannot say the brand name. I also am pretty sure I bought it at Michael’s! I do know that the ribbon yarn for the poncho in the first photo was lionbrand Incredible yarn in Rainbow color! Well, it’s really pretty anyway. 🙂 And all the stiches I have learned from here are great, thank you so much for all the work you do here. Thank you Robin. I have a market bag made with this stitch and was wondering how to create a copy! I am like Danette above and would love to see the pattern for the poncho, please? 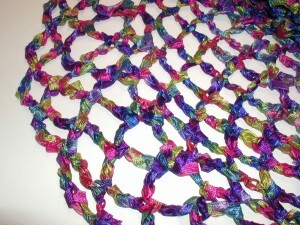 It is the second pattern in the book – Variegated Ribbon Poncho. Do you have any ideas for a market bag using this stitch? This would make a nice necklace in any colors you choose as well as the variegated. I love it. With my old neck, I prefer very light weight necklaces that look airy and soft. Thank you. i love the yarn u use here!!! awesome job!! I am using this stitch to make a sarong for my daughter’s Miami trip. Hopefully the link will post http://www.flickr.com/photos/[email protected]/5704680145/ I’m using an egyptian cotton and boy is it difficult to work with, but the colors are so vivid! Wow Rene, Gorgeous work! I love the colors of that yarn! Sure! 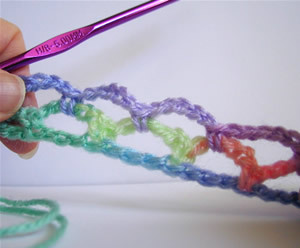 Try starting out with a ring you make with a few chains, then make some of these loop stitches into it so that you make a circle and you’re working in the round. 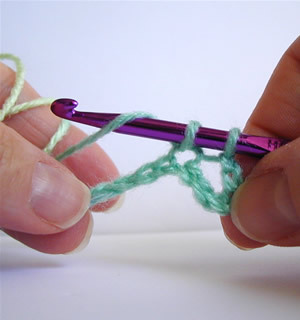 When you get back to the beginning of the round, make your stitches in the loop stitches on the previous round. If you want to increase, just make more than one loop stitch into a loop stitch on the previous round. Have fun and experiment! Can you explain how to do the ends to keep them straight? there has to be a way to anchor each end. How do I make this stitch in a long triangle shawl shape? Actually a ponchos… not like a water type but like a crochet “ponchos”. Do you have a free pattern for the poncho? I made one years ago but have since lost the pattern. Thanks for your help. How do I do turning at the end of each row when I want to do multi layers of chain. Hi Twen, at the start of row 2 (and in each row after row 1), you’ll start by chaining 5, then turning your work to work across the row you already made. If you look at the photo at the start of row 2, it may help you get an idea of what to do. Hi Shannon, to decrease you can skip a ch-5 space as you work. To increase you can make more than one “ch 5, sc” in a ch-5 space. 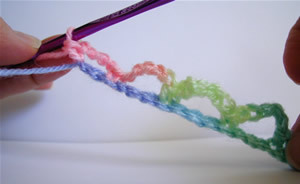 The Angel Lace Scarf is a good example of this stitch in a triangle shape. Thanks so much Rachel for the fishnet pattern. I really appreciate you sharing this pattern. I had forgotten how to do this pattern and your tutorial is very helpful. Also, I would like to turn this pattern into a shawl. How many foundation stitches do you recommend for a fishnet shawl? Thanks again and look forward to your response. It really depends on the hook and yarn size you use, and your gauge. I would suggest making the foundation as long as you want your shawl to be. Hi there, So I can do this in square, but I tried in circle and it just started curling up. 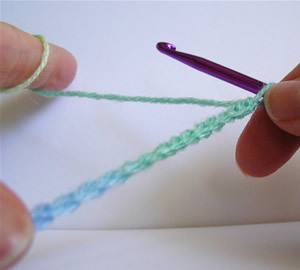 I don’t know the short hand talk of crochet still a very early beginner. How would I be able to do this stitch in a round circle without it curling up as I go bigger. Hi Paula! You would have to add increases as you go. This tutorial doesn’t cover increases, but the number of increases would depend on the number of stitches you start with. To make a increase you will make more than 1 stitch into one stitch. But I must admit that I absolutely love this stitch… so each and fun to do. What size hook did you used in this diamond mesh scarf? Hi Yolanda! The hook Robin used in the photos is a H (5.00 mm) hook. the ribbon used is from “lion brand yarn” and the name of it is “incredible” , lable says ” a ribbon yard for knitting and crocheting”. How to make an increase if I want to make a skirt? If you want to increase, just make more than one loop stitch into a loop stitch on the previous round. Hiya! Thanks so much for this pattern! How would I go about increasing/decreasing the stitch? Sorry if this has been asked already, my phone won’t allow me to view comments! Hi B! If you want to increase, make more than one loop stitch into a loop stitch on the previous row. To decrease you can skip a stitch on the previous row. And orchid. So far, its turning out wonderful.